White Township, Pennsylvania A new homeowner found an old wooden box under the stairs while renovating his home before moving in. 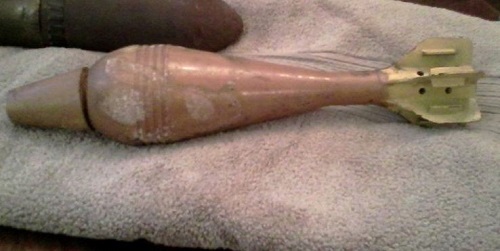 Upon inspecting the contents, he found it filled with military munitions. He stuck it back under the stairs and continued with his project. It wasn't until it was actually time to move in that he decided he should contact authorities about the find. Pennsylvania State Police explosives experts arrived on the scene to discover the box was filled with WWI and WWII military-era munitions. Upon x-raying the devices, some were found to be live and were safely removed to a secure disposal site. It is unknown how long the ordnance had been in the home.